The indicative boundaries of the research area are shown on the map below. Completely removing predators within the block. This approach uses a more rigorous method of applying aerial 1080 than standard operations. The operation was originally scheduled to be carried out during winter 2018, but was delayed as a result of unfavourable weather conditions. We now propose to begin the operation in March 2019 (subject to receiving approval from DOC and the Medical Officer of Health). ZIP field staff. Staff are regularly flown by helicopter to and around the site. traps, as well as detection devices such as chew cards and motion-sensor cameras. satellite communication facilities at Scone Hut, some temporary access routes, and three temporary bivvies (for ZIP and DOC staff). a predator gate on the swing-bridge across the Perth River near Scone Hut. Please do not interfere with the equipment or any trapped animals because doing so will compromise the results of the research. ZIP and DOC staff are continuing to meet with Te Rūnanga o Makaawhio, Te Rūnanga o Ngāi Tahu, local people and recreational users of the valley (particularly climbers, trampers and hunters) to identify any impacts of the research programme, and options to reduce the impacts. distributing a small number of tahr carcasses above the operational area, as a more attractive, preferred, food source. 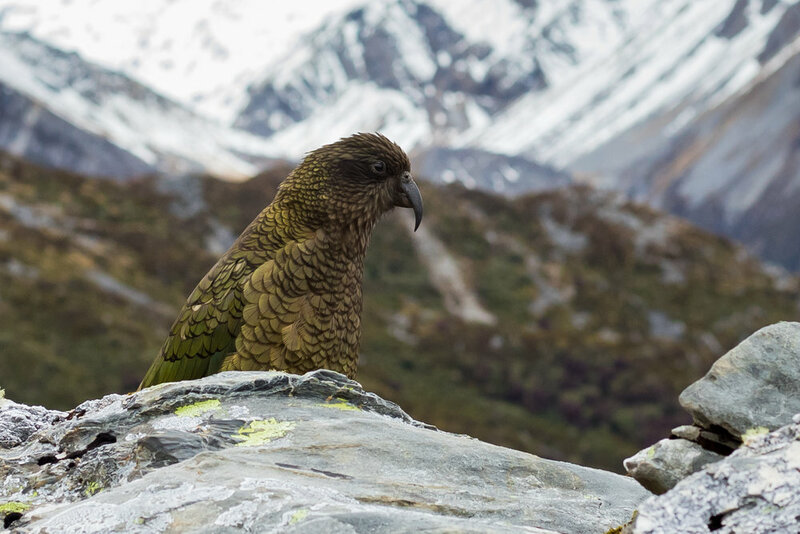 We have also fitted bands and radio-transmitters to kea, to monitor the impact of applying aerial 1080 on their mortality and breeding success. We are also monitoring the impacts, if any, of the operation on whio, rock wren, and tahr (the latter in collaboration with the Game Animal Council and New Zealand Deerstalkers Association). the control area is relatively accessible (by helicopter) from a road end. To learn more about this project, please email us at info@zip.org.nz, or call ZIP’s Operations Director, Duncan Kay, on 021 069 0167.